Ok, so you can’t actually add more time to a 24-hour day…BUT you can make more of the time you DO spend on your business. When I’ve asked fempreneurs what they need most in their life and business most say either time or money. For this post let’s take a look at time (which also impacts your money). 2. Bunch related or small tasks. 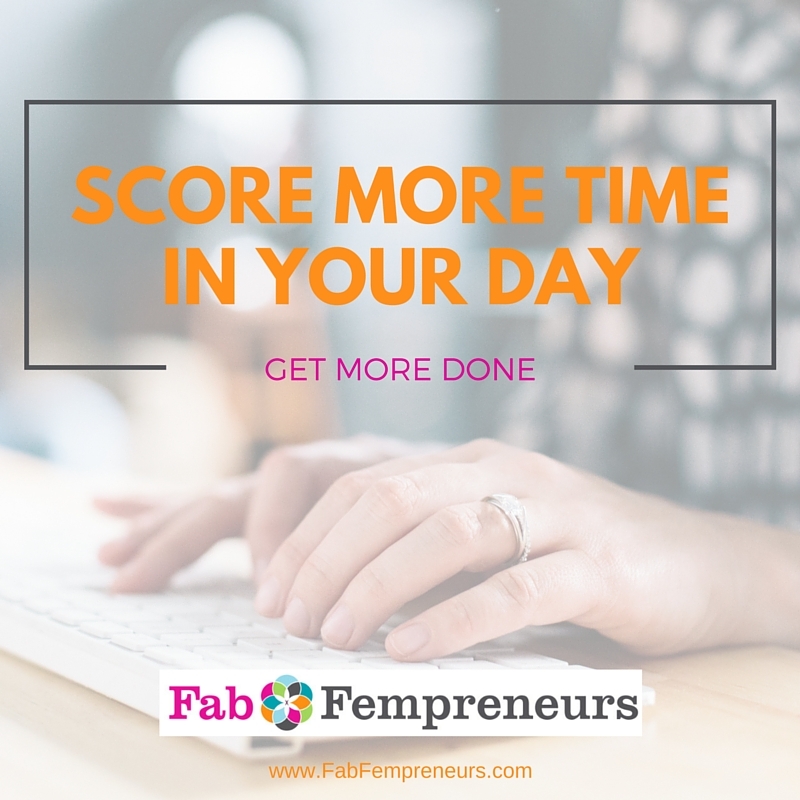 Instead of scattering small, unrelated tasks through the day, block off an hour to get them all done. These could be things like renewing your domain names (yikes- you don’t want to forget that! ), sending that quick follow up email to say thanks or share a resource, or reserving a meeting room at your coworking space. The key here is to stay focused on each task, complete it, and move to the next until your list is complete. This can be lots of fun too- think of it as a contest, and reward yourself at the end. Be sure to not discount this one- it could be one of the sneakiest time suckers! You’ve probably had a time or two when you had a personal errand that had to be accomplished before 6PM, but really needed to meet a business deadline. Feeling overwhelmed, you may have ended up skipping lunch to do it, or driving through a fast food place eating on the go. Ugh, right? 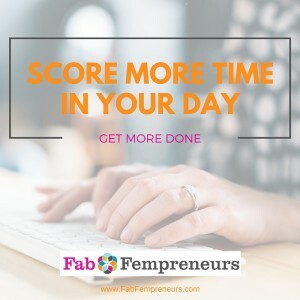 A stress-relieving and time saving strategy to find more time in your day and get more done in your business is to find a way to delegate important tasks, whether personal or business. A more obvious way to do this for personal tasks is to ask family members who live with you to take on additional chores. Next, get creative and find out if your neighborhood association offers dry-cleaning service drop off and pick up, a mobile detail/carwash service, or food delivery for example. I love going to the Farmer’s market, but often don’t have the time to break away from important projects and clients during most weekdays. BUT, with the new services out there for fresh produce delivery to your door at an affordable price, you can finish up your project or client meeting and come home to fresh produce ready to eat. I love that! Same goes for business tasks that really need to get done, but you either don’t like to do or don’t know how to do them. Move toward focusing on the things you do best and that generate revenue in your business. If you know you need to delegate business activities and aren’t sure where to start, check out this delegation matrix. 4. Turn off notifications and eliminate potential distractions. In a high-tech, highly connected world, it’s easy to be constantly checking your phone. You heard this before, but it’s time to DO it. Put your phone away or turn it on silent for a full hour or 90 minutes to work on a super important project. If you must keep your ringer on for possible emergencies with your kids or family members, find out how to keep your ringer on while silencing other notifications. It absolutely derails me from a task when I hear a “buzz” or “ding” notification every time someone has commented on or retweeted my post, or a family member sends me a text middle of the day. I LOVE the engagement, but it can certainly wait for an hour! Simply schedule a time to get caught up on social media, or check your phone messages after you’ve completed an important task. It really feels empowering and I encourage you to try this ASAP. Decrease the compulsive phone checking and you’ll find you’ve gotten more done- not just more things, the right things. It’s time to score more time in your day and make your business touchdown! Which of these are you going to implement first? Tell us below in the comments!